Our most popular fonts are shown below and below that are lots of important (and perhaps, tedious) details about engraving if you are going to order via email. Engraving is forever – please read carefully! We realize that we are creating an heirloom, and our goal is to engrave every item perfectly and to your satisfaction. You can send us an email with your engraving instructions. Unfortunately, we learned the hard way not to take engraving instructions over the phone. We’re happy to have you call us, and we can go over your order or any questions you may have, but we must insist that we receive engraving instructions in writing. 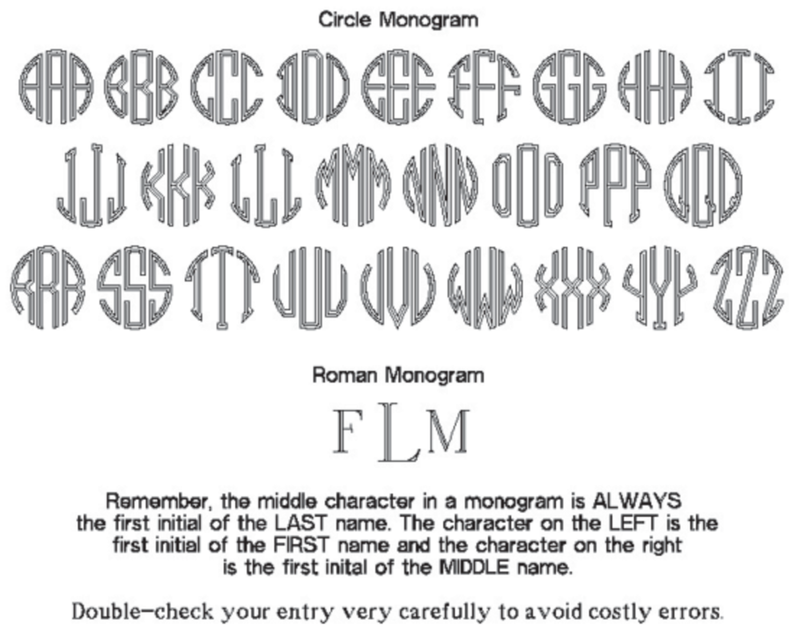 Take a look at our font and monogram styles, and choose the font you would like. Generally, a Roman or block font is good for a boy and script is good for a girl. The Victorian font is nice for either a boy or girl. Amazone is the nicest script, in our opinion. - Specify horizontal or vertical orientation for a frame or an album. – For cups, specify which way the handle faces when the engraved message is facing out. If you don’t specify, we’ll engrave with the handle to the left. – Also for cups, you can put engraving on the front and back, so let us know what you want to put where. If you don’t specify, the “front” will be with the handle facing to the left. – If you choose a monogram, keep in mind that the middle character of a monogram is the first initial of the LAST name and is larger. The first and middle initials go on the left and right respectively and are smaller. $21 for the 1st 10 characters, then $1.00 per additional character after the 1st 10 characters. $21 is our minimum engraving charge unless otherwise specified.